When it comes to quantifying fitness, one of the single best ways to express how “in shape” someone really is, is by finding their VO2 Max. While many people know their current weight, circumference measurements, and even body fat percentage, not many are acquainted with their VO2 Max. Although these other metrics are more commonly tracked, they fall short when it comes to predicting fitness level accurately. VO2 Max on the other hand is a testable value which directly reflects aerobic capacity. The greater your aerobic capacity, the more work you can perform over an extended period of time. In addition to reflecting overall fitness, VO2 Max is an excellent indicator of health. 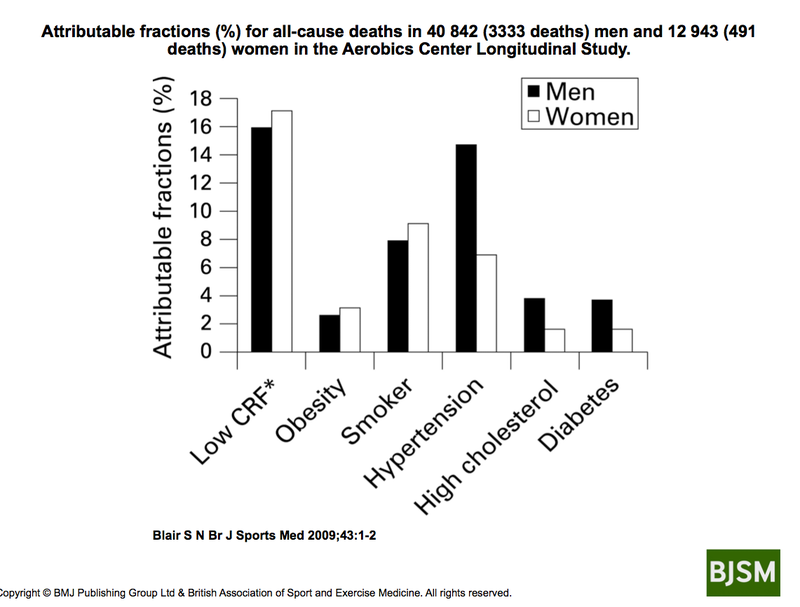 A professor at the University of South Carolina, Dr. Steven Blair, has reported that “cardiorespiratory fitness” is a greater risk factor for cardiovascular mortality than any of the more traditional risk factors that our medical profession typically focuses on” In a review of over 53,000 medical patients, Dr. Blair found that the most common factor leading to death was poor cardiovascular fitness; beating out factors such as hypertension, obesity, smoking, high cholesterol, and diabetes. As a marker of health, the American Heart Association recommends VO2 Max be tested regularly in addition to resting vitals such as heart rate or blood pressure. VO2 Max is the maximal rate of oxygen consumption during exercise. Expressed as the total volume (V) of oxygen (O2) consumed per minute, (L/min) the number represents the maximum amount of oxygen you can uptake and utilize when breathing. It is common to see VO2 Max written as a relative score, such as 65 mL/kg/min, which is found by adding body mass to the equation. It is in this way that we often see VO2 Max scores for athletes. As a comparison, the score of an average person can range from 30-50 mL/kg/min, while athletes have been tested as high as 90+mL/kg/min. Not to be confused with lung capacity which simply represents the amount of air you can take into the lungs with each breath. While both can be improved through training, VO2 Max has more to do with the efficiency of the lungs than the amount of air they can actually hold. Someone with a low VO2 Max for example might be able to breathe in 6 Liters of air in a full breath, but will only be able to uptake 2 Liters of oxygen over the course of 5 to 8 breath cycles, wasting a great deal of O2 on the exhale. Finding your true VO2 Max requires participating in a graded test using aerobic exercise equipment such as a treadmill or cycle ergometer. During a test, the participant wears a mask connected to a device which measures ventilation, and the amount of oxygen and carbon dioxide in the expired air. The test begins at a mild intensity, and gradually progresses up to maximal intensity. If you’re a serious endurance athlete or exercise physiologist, you’re likely familiar with this test, as it is a staple for assessing athletic performance. 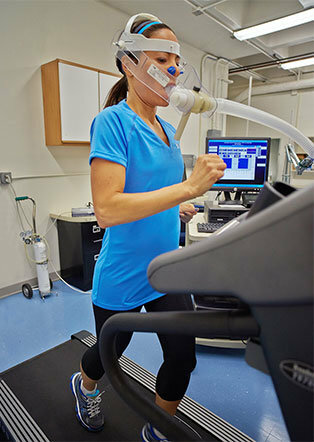 While the test is the most accurate way to find your VO2 Max, it requires a lot of specialized equipment, and can be relatively time consuming. It can also be risky to participate in maximal testing if you are in poor health. Luckily, there are a few alternatives for estimating VO2 Max which have been found to be very accurate. If you want to know your VO2 Max, but aren’t interested in getting tested at a sports physiology lab, you’re in luck. There are a few simple tests which you can self administer to find a close estimation of your VO2 Max. Now that you know a little about VO2 Max and how to find yours, you might be wondering how to improve it. Although a small percentage of the population (~10%) seems to have a fixed VO2 Max, most people can improve theirs by simply participating in cardiorespiratory exercise . All it takes to improve your current level of fitness is to push yourself slightly beyond your current limits. For those with low level of fitness, simply walking or performing other low intensity exercise is usually sufficient to improve VO2 Max. If on the other hand you’ve already got a moderate level of fitness, it will take a little more than simply walking. The list below has a few great exercises for improving aerobic capacity. Try them out next time you go out for a cardio session, and if you train hard enough, you might just be the next Bjørn Dæhlie. Bouchard, Claude, et al. “Familial Aggregation OfVËo 2 Max Response to Exercise Training: Results from the HERITAGE Family Study.” Journal of Applied Physiology, vol. 87, no. 3, 1999, pp. 1003–1008., doi:10.1152/jappl.1999.87.3.1003.